At Modern Smile Center, we believe the best dental treatment is no dental treatment. It’s unfortunate that historically, the dental and healthcare industries seem to be focused more on the treatment of symptoms rather than preventing disease. That’s why we’re dedicated to a preventive model of dentistry that aims to find and treat the underlying causes of your symptoms, so we can come up with a plan together to help you make changes to improve your oral and overall health, because the two go hand-in-hand. When your hygienist asks you if you’ve been brushing and flossing regularly, we promise we’re not trying to make you feel guilty. We only ask because daily oral hygiene really is one of the most important factors when it comes to your oral health. And poor oral health can have many more consequences for your overall health and wellness than you may realize. We just want you to be happy and healthy! Our hygiene team is one of the best in Tomball. They are warm and friendly to make your cleanings relaxed and pleasant. They have a gentle touch to minimize any pain or discomfort during the cleaning process, yet impressively thorough so they won’t leave any plaque or tartar behind. And they promise not to ask you questions when they have their hands in your mouth. Here’s some advice straight from your oral health authorities at Modern Smile Center on how to keep your smile clean and healthy in between visits. Invest in an electric toothbrush (they really do clean better than a manual) and brush at least twice a day. Hold at a 45-degree angle and brush in small concentric circles, and focus on brushing along and under the gum line. Brush every surface of your teeth (front, back, biting surface) and reach all the way to the back. Brush the tongue or use a tongue scraper to remove bacteria and bad breath that live there. Floss every day. Curve the floss in a c-shape around the teeth and under the gums, rather than snapping the floss up and down. Use a new section of floss for each tooth to avoid re-depositing plaque and bacteria. If you don’t like traditional string floss, Soft-Picks® are a great alternative. There are also other options including water flossers and hand-held flossers. Rinse with mouthwash after brushing and flossing to kill more bacteria in other areas of the mouth that brushing and flossing cannot. Mouthwash can help prevent tooth decay and gum disease and helps keep your breath minty fresh. Rinse with water after eating or drinking and between meals to minimize acidity and plaque buildup. Rinse with water after eating and before brushing to avoid damaging your enamel, and when brushing is not available. Visit us at Modern Smile Center twice yearly for regular exams and cleanings. 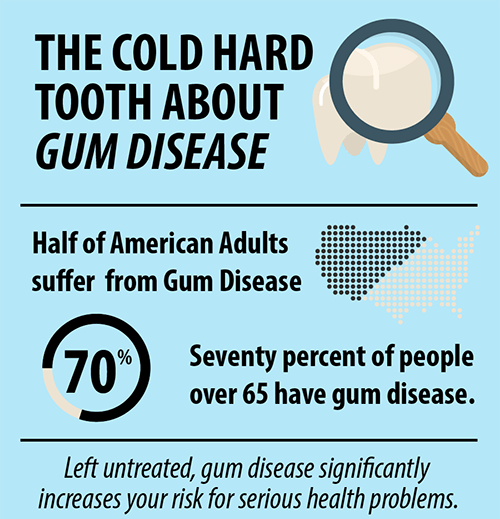 Did you know that most American adults suffer from gum disease? Did you know that left untreated, gum disease can cause tooth loss and increase your risk for heart disease, stroke, diabetes, and many other serious systemic diseases? If your gums are bleeding when you floss, we’re sorry to say you have gingivitis or early stage gum disease. Left untreated, gingivitis can quickly progress into periodontitis or periodontal disease. The good news is, gum disease is totally treatable – and preventable! When plaque is allowed to harden into tartar, it can irritate the gums until they begin to pull away from the teeth. This is called gum recession. Deep pockets begin to form allowing the disease to progress. Gum disease is a bacterial infection. The bacteria associated with gum disease have a direct pathway through the gums, into your bloodstream, and into your heart. These same bacteria have been associated with at least 52 other serious systemic diseases. If caught in the early stage, gingivitis can be treated with some simple improvements to your oral hygiene routine. More advanced cases may require more advanced periodontal therapy that may involve gum surgery. We may prescribe an oral antibiotic or mouth rinse to help get the infection under control. If your gums are bleeding and you’re seeking a skilled and compassionate dentist to provide gum disease treatment in Tomball, you’ve come to the right place. You should call us right away to seek treatment before the infection gets worse. 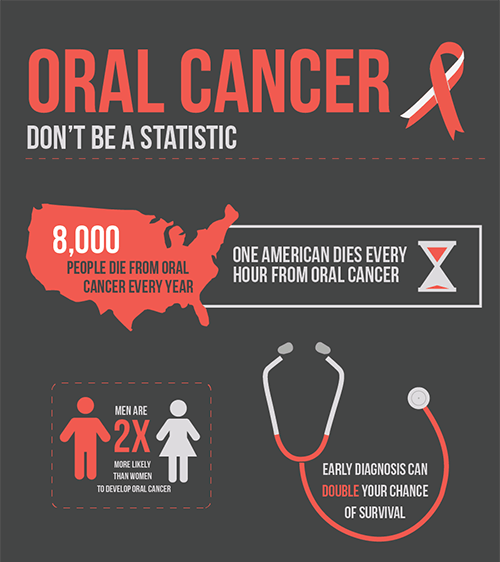 Oral cancer is unfortunately on the rise in the United States, and the mortality rate is high because often it is not detected until it’s too late. Your Tomball dentist is in a unique position (inside your mouth!) to detect and diagnose oral cancer in the early stages before it progresses and becomes deadly. We are always on the lookout for any changes or abnormalities in your mouth that may be signs of oral cancer, and you should be on the lookout at home, too, especially if you fall into any of the high-risk categories. Come see us today for an oral cancer screening and get peace of mind. If you or a family member is involved in any type of contact sports, we highly recommend a custom mouthguard to protect your best asset – your healthy smile! Mouthguards work wonders in preventing oral injuries, tooth loss, and can even minimize the impact of concussions. Yes, you can buy stock guards at your local sporting goods store, but only a custom mouthguard offers the best, most comfortable fit and the highest level of protection. If you’re one of many patients who clench and grind your teeth at night or suffer from TMJ/TMD, a mouthguard can work wonders to protect your teeth and minimize the impact on your jaw joint. Many of our patients have found relief from bruxism and TMJ with a custom night guard. They used to wake up with a sore mouth and jaw (not to mention worn down teeth and failing dental restorations), now they wake up refreshed, pain-free, and ready to take on the day! To get started on your health and wellness goals.